Halloween morning on the 10, my bus number started with 13 and was acting up. The headsign would randomly go blank, confusing passengers waiting at stops served by multiple routes. One of those passengers was Dierdre, waiting under the black olives at her usual spot. She was talky this morning about everything on her plate, struggling along the tragic path of her legendary namesake. The route rolled along, reliable and mostly on time. We pulled into the north layover, I popped the parking brake, and went to unclick my seat belt. Two men with the grit of street life on their skin and hair strolled by my open door, talking about the holiday. With the fresh sun casting gold in their faces, they glanced my way and one almost immediately pointed at me. "Look at this guy, he's dressed as a bus driver!" He proclaimed. 'That's my costume.' I agreed, a little pleased that the choice was made for me. Mid-morning, and we were well up into Pompano. My friend the older Brazilian woman was huffing and puffing to cross the street, cutting it close this morning on her way to work. She made it ok, gasping and glistening from the effort. 'Bom dia!' I greeted her with some of my sparse Portuguese. Normally verbose, she could only respond with a wide smile as she paid the farebox and focused on catching her breath. Late morning and our final southbound trip were both underway at the same time when another mature woman boarded in Deerfield Beach. Her white hair was a sign of advanced years, and she took full advantage of all of them. "Oh, I have an extra dollar. Senior." She hurriedly offered up. 'Put in a dollar.' I encouraged her. "How old do you think I am? Be honest." She asked me unfairly. '60s?' I guessed after a hesitant assessment. "Nothing." She answered, halting the topic. "I'm going to the church 'cuz my husband died five years ago. Cigarettes." This quirky box on wheels glides up and down a major artery through our cities; a single cell among thousands containing a world within. What it holds will come and go, giving and taking in equal measure. Ain't that something. 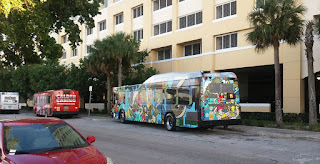 BusTropical is a blog by a Broward County Transit bus operator. The purpose is really quite simple: to document the beauty of our community. 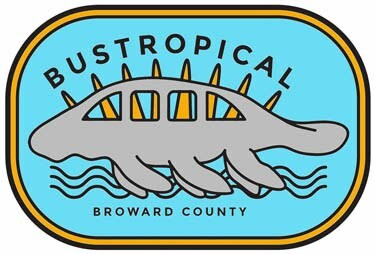 This is not a ranting blog, it is a love song to Broward County. DISCLAIMER: All works expressed on this site are my own and do not represent the opinions of my employer. Now you can have Hugh the manatee bus with you always. Free stickers available all over town. Or drop me a line. Born of sand and sun. Powered by Blogger.